Greece has delivered a dramatic and sensational rejection of the terms demanded by its creditors in return for aid, putting itself closer to leaving the euro. 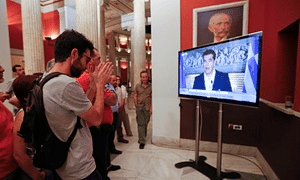 With more than three quarters of votes counted, around 62% of Greeks have voted No, or Oxi stunning the eurozone, and opening up another chapter in this long crisis. 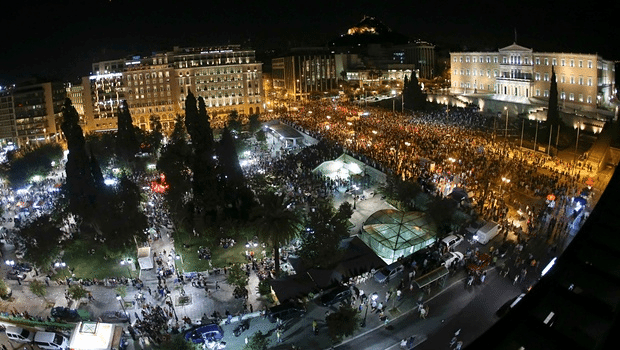 Thousands of No supporters have hit the streets of Athens tonight to celebrate the verdict. Greece’s prime minister, Alexis Tsipras, while addressing the nation few minutes back said that, Greece has proved that democracy cannot be blackmailed; Greeks have made a brace choice, and one which will change the debate in Europe. “I understand that voters have not given me a mandate against Europe, but a mandate for a sustainable solution.” And he warns that there are no easy solutions — but a fair solution can be found, if both sides want it.We are ready to continue negotiating with a reform plan, and the goal of restoring our banking system to normality quickly. Tsipras also declared that Greece will insist on debt restructuring being on the table at those talks. “I have asked the Greek president to convene the party leaders meeting tomorrow for a briefing, but also hear their views,” he adds. As per him, today’s vote does not mean Greece is heading out of the eurozone.